'Governments around the world are using behavioural insights to help people achieve their goals. This great new book shows how you can use the same tools in your own life. Go nudge yourself! '- Richard Thaler, winner of the 2017 Nobel Prize in EconomicsA simple and accessible plan for success, based on seven scientifically tested steps that really work. We're often told to dream big, the sky's the limit and that nothing is impossible. While it is undoubtedly good advice to set yourself goals that have the potential to make you and those around you healthier and happier, how to reach those goals is often less clear. From getting fit or securing a new job to becoming a better manager or parent, simply setting your mind to something will rarely get you where you want to be, and big plans can quickly become overwhelming, leaving us feeling as though we've failed. Most of us set goals with very good intentions, so why do our best-laid plans so often go awry? When we're so committed to making positive changes and fulfilling our ambition at the outset, is there a way of avoiding the common roadblocks that stand between our goals and us? Thankfully, the answer is yes - and it's much easier to achieve than you might think. 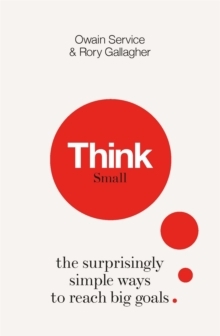 Working inside the world's first Nudge Unit, Owain Service and Rory Gallagher know the huge impact that small changes and clear plans, based on a scientific understanding of human behaviour, can have from an individual to an international level. 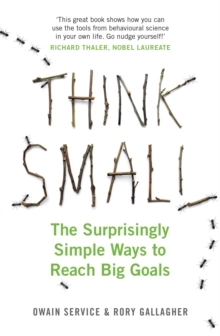 For the first time, Think Small takes these successful approaches and translates them into an easy, simple framework that has the potential to make a big difference to all our lives.